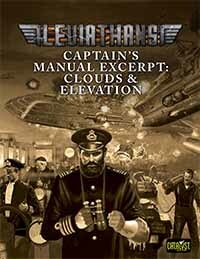 Catalyst Game Labs takes to the skies with a set of rules for various elevations as well as clouds for Leviathans. Been a while since the last update and so thought I’d make it well worth your while. First, the Kickstarter. If you’re wondering why we haven’t mentioned anything else, it’s because we’re still waiting on our own data. I turned over 9 spec sheets and then an initial rough estimate on the first few months of a schedule to several manufacturers and that’s simply a pile of data they have to work over. Once they’ve worked it over to generate price quotes, then we have to work it over. Then plug that data into what we’ve been tossing around on the Kickstarter side so that it all meshes and what we say we can provide is what we can provide and at the best price for both you guys and us. Hopefully in the next few weeks we’ll really start to be able to provide additional details. Second, and the “hopefully worth the wait”, we’ve had a lot of players for a long time asking for the elevation rules. And I’ve been hesitant for a long time, but ultimately I decided that my hesitation was likely a hold over of previous ways of doing things. And releasing materials for the players to enjoy and bash is absolutely what Leviathans is all about. While we were at it, while we’d previously released the clouds, we thought it a good idea to simply roll them all in together.